We added this bundle of joy to our family in early January and he has been keeping us busy! ​ We are planning to expand our farm with new plants this Spring as well as explore new markets. Our greenhouse continues to develop. With warmer weather, we are getting excited to spend more time outside and see how the lavender has survived the winter. Prairie Harvest in Newton, KS and On the Wildside in Manhattan, KS are now carrying FHLF products! These are two unique Kansas stores definitely worth visiting! We have started selling at Grove Gardens in Council Grove, KS! They are open 7 days a week and located right on Main Street. 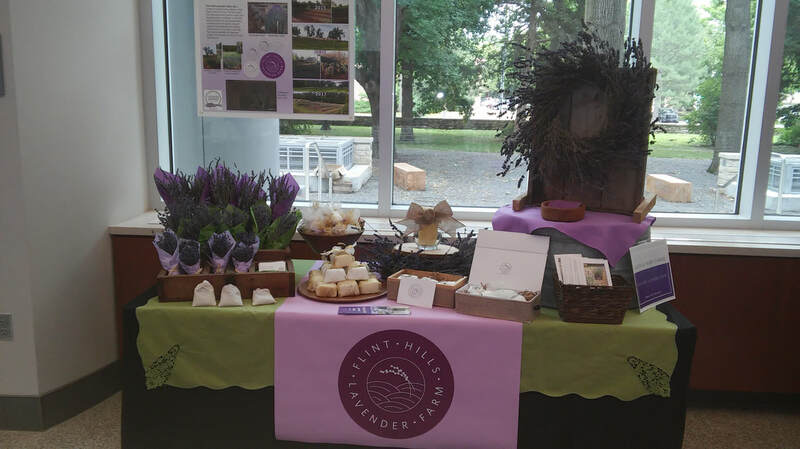 Besides plants, pottery, and produce they sell local goods like honey, soap, apple cider, LAVENDER and more! For inspiration, delicious produce, and groovy local products; we definitely recommend you stop by (they are open through October)! SIDE NOTE: We have fire starters available for sale now and we continue to improve our wreath making skills! We have been busy expanding and perfecting our product line! With experimentation and research we've discovered the best recipes for ROOM & BODY MIST and LAVENDER LOTION to share with our customers. Our newest batch of FIRE STICKS is made with only lavender stems. All parts of the lavender plant hold oil but the oil content increases as it gets closer to the buds. What this means is more lavender aroma and flavor! We plan to have smaller travel sizes of the lotion available soon and before the year is done we will have gift boxes available for sale! Let us know what you think of our products -- we love hearing from our customers and any feedback is welcome! The program ended with a Launch Party showcasing the eleven diverse businesses that participated in the program. The event was open to the public. Each business had a table display (our's is pictured below), gave their pitch to attendees, and answered any questions guest might have. Prizes were awarded to each business at the end of the evening. We hope to use the money we were awarded toward buying plants and funding our greenhouse project. ​The LAB program has been helpful in educating us about business terminologies, strategies, and methods from finances to business planning. We had an amazing student to work with named Elizabeth Gibisch. She helped us explore the market potential in the Manhattan area as well as analyze financial data for us. The research Elizabeth did for us was one of the most beneficial parts of the LAB program and showed us the tools and methods for how we can move forward. Getting advice from the mentors provided insight into the wide world of business. What an amazing opportunity it was to be accepting into such a generous program! We feel so lucky and grateful to have been a part of it! It has truly given us the focus and inspiration we needed to move our business forward. Mary is a stay at home mom with a love to create.